The big news out of the Maldives this week is their new promotional campaign ‘Maldives Always Natural’. The announcement of the new logo has gotten most of the press, but that is just one piece of a larger, more ambitious marketing positioning. The logo got lots of coverage especially as such branding changes always inspire a lot of cynicism for any organisation. Lots of self-proclaimed artistic pundits take issue with one detail or another and proclaim that they could have done better. The Maldives Marketing and Public Relations Corporation was at the forefront of the changes, but it merely served as an orchestrator for many Maldivian stakeholders whose interests were being represented. MMPRC started with a call for submissions for ideas and proposals from schools and the public. They enlisted worldwide professional expertise with a specialist company called QUO. Now the MMPRC have published the initial treatments which bring to life the slogan in a variety of contexts. Its predecessor slogan – ‘Sunny side of life’ was cheesy, tired and pedestrian. It looked like it was promoting some down-market Spanish holiday camp. It was fit for purpose in the early years of catering to the European sun holiday market. 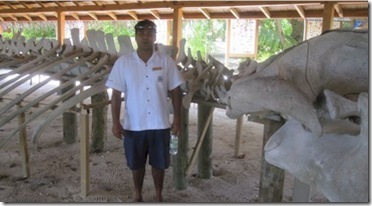 But now, the ‘Maldives’ is a world-wide brand drawing visitors from all corners of the globe. And its aspirations extend beyond just tourism as it promotes other industries like fishing and takes a prominent place on the world stage for ecological issues. Considering the huge scale of pressures and diversity of scrutiny that a government body is under, and the very broad brief, the Maldives are limited in how ‘out there’ and edgy they can get. I think the effort is very commendable and is a big step forward. What I like about the logo is the colours. One truly distinctive feature of the Maldives is the various shades of blue in the aquatic tapestry that blankets the islands. I’ve tried to incorporate that shades-of-blue colour palette in the design of Maldives Complete. The logo colouring really nails this superbly and subtly (contrary to the garish and dated style of the predecessor). The pictures here show the various treatments and the full sized images can be found here. While perhaps the most famous ‘beach’ sport (and the only one of Olympic standing), Beach Volleyball is not the only ‘beach’ game in town. In fact, there are so many, that the Maldives was just this month announced as host of the next 2013 South Asian Beach Games. Including some I have never even heard of. One of those is ‘Beach Tennis’ which Palm Beach features. It is also known by its Italian name, Racketoni. Basically, it is a paddle like racket with a slightly heavier tennis ball. You will often see it on beaches around the world where people play without any net or court just hitting it to each other and trying to keep a volley going. But Palm Beach has a proper, dedicated court at Palm Beach as well as an instructor, Mohamed Adam (shown here in the far court). If you like your beach time a bit more active, then probably the most popular beach activity is Beach Volleyball. 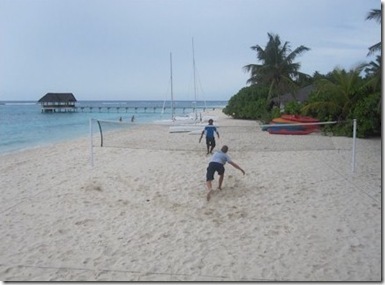 Not just in the Maldives, where it is definitely the sport you will see most often set up at resorts by the waterside with often a keen staffer stirring up some play among the guests. But worldwide in this Olympic year. In my day job with Red Bee Piero, we are starting to prepare special functionality for covering the London 2012 Games and Beach Volleyball is right at the top of the list of events that major market broadcasters cover in detail. 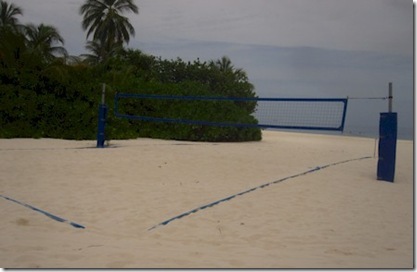 A number of resorts have the nets and line markers laid out quite well. But only a few have the soft sand for those diving saves. W Retreat not only offers both of these, but a number of other uniques in its world-class standard Beach Volleyball court. First, it has padded net stands for further protection from ambitious play. Secondly, the W provides ‘antennae’ for out of bound marking on net (the photo doesn’t show them). 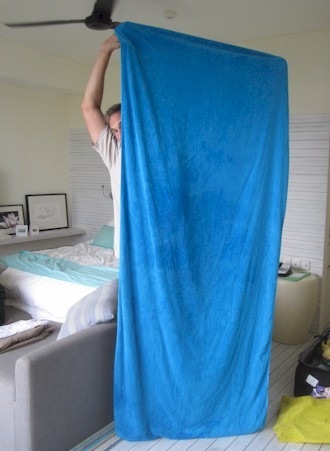 A big shower calls for a big towel. 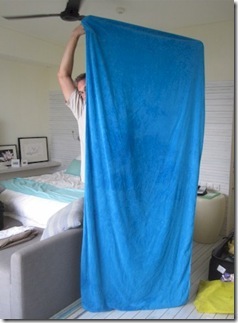 And the biggest towel I have ever seen, in the Maldives or elsewhere, are the Kandooma beach towels. They are longer than a king sized bed (more than 2 metres) and nearly 5 feet long (see above). That’s me holding it up and I’m an not a small guy (I stand 6’ 4”). 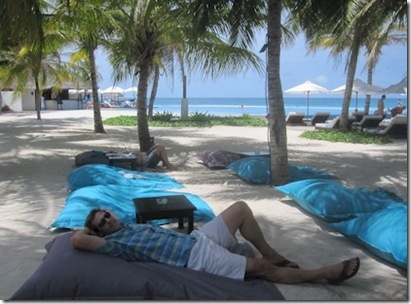 They were also soft and fluffy (I hate stiff, thin hotel towels) and quite a fetching shade of Maldivian blue. Also, especially good for claiming large swathes of beach loungers. Some prefer the bath, some prefer the shower. If you prefer a drenching standing up rather than lounging in a gargantuan pool amidst the sprawling expanse of water, than Anantara Kihavah is the place for you. 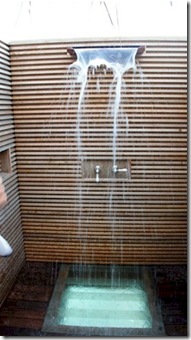 Their water villas showers feature the latest trend in the super luxury bathing fixtures – waterfall shower. It was just a few years ago that Rain/Drench showers were introduced for a more sumptuous showering experience (the previous innovation to that was the variable, pulsating shower Massage fixture). In the ever escalating arms race of 5-star-plus decadence, waterfall showers are the new 6-star thing. I first experienced one of these at Four Seasons Landaa Giraavaru (see below). To cap off the experience, Anatara have added a glass floor so you get the whole water surround experience. Just don’t scare the fish away with your singing. 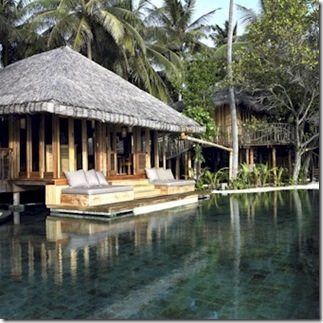 If the biggest private pool is not enough aquatic acreage for you, then of course you have the water villa option. 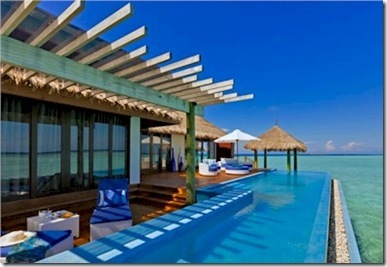 And if you really want it all, then you can have a big private pool on your water villa. Velassaru’s Water Suite features a 30 metre long pool covering 105 sq/m that pips Shangri-La Villingili Villa Muthee’s (104 sq/m). If the kind of ‘space’ that you like in your pool is less the ‘starry night’ type, and more the ‘stretchy out’ kind, then Soneva Fushi’s Jungle Reserve Villa (villa #42) is the one for you. It’s private pool extends 150 square metres (15m x 10m). That comparer to the runner up in astronomical aquatic acreage of Four Seasons Landaa Giraavaru’s Royal Beach Villa with 113 sq/m. If the underwater stars that dazzle you are star fish, starlets and feather stars, then Park Hyatt Hadahaa is the place to swim to and at. Not much better authority than Adrian Neville. And he’s just finished latest research for his upcoming edition of his must-have book on Maldives resorts ‘Resorts of the Maldives’. Check out his Twitter stream for 140-character advance tidbits. 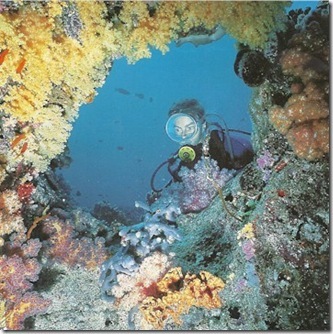 Hadahaa is in the Gaafu Alifu atoll which Harwood and Bryning’s book “Complete Guide to Diving and Snorkeling the Maldives” describes as “The coral reefs inside the atoll are in great condition and a marvel to dive and snorkel” (see picture above).